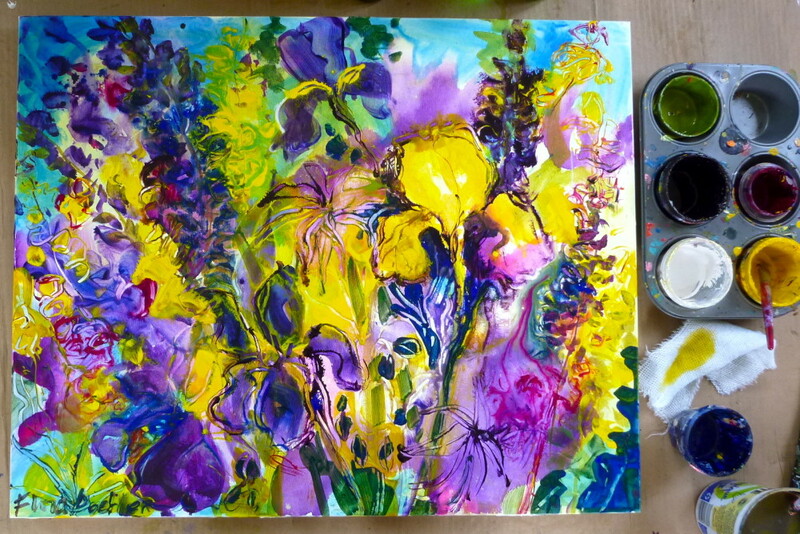 Right now, I’m headed outside to paint iris and lupins. Here is a repost of a blog I made in 2010 about painting at this time of year. I will try today to express the emotional connection I feel for iris as I did in this painting. 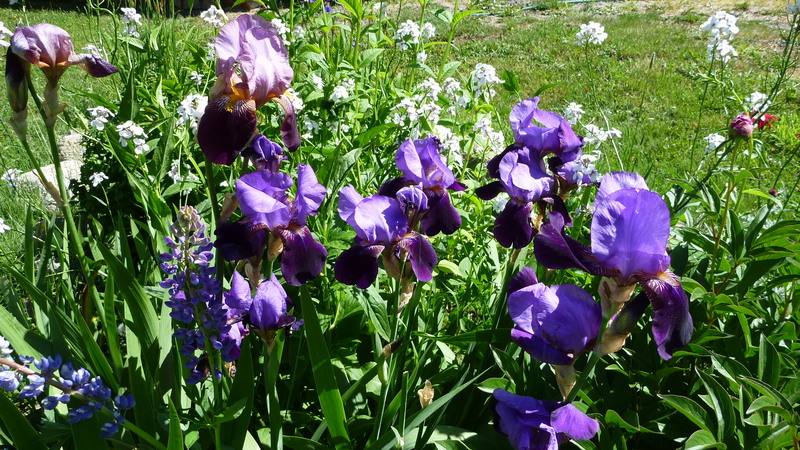 There were gorgeous, large bearded irises in my grandmother’s garden over 50 years ago. My mother transplanted some to her garden and eventually I had them in my garden. 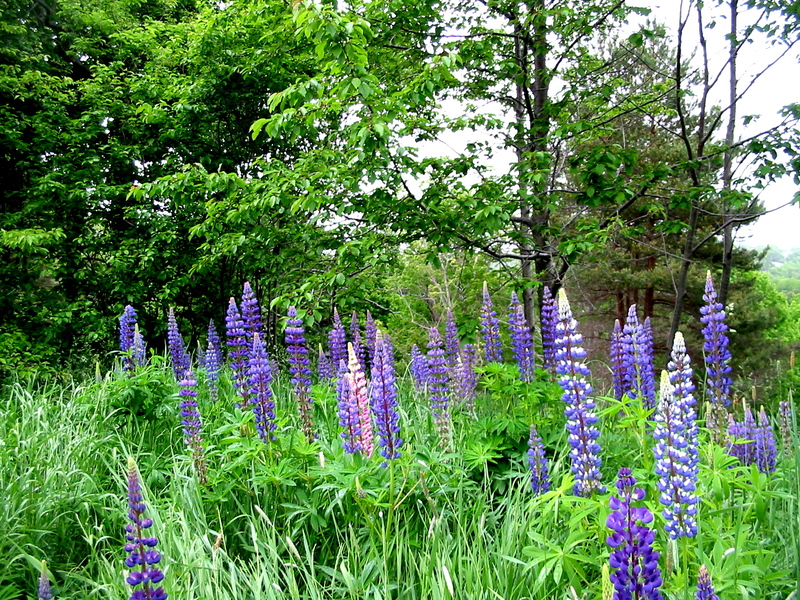 They moved ½ way across the continent with us when we came to Nova Scotia and are blooming like never before. Bearded Iris from my grandmother. I know my mom and my grandmother would have loved the yellow variety that I’ve added to the ancestral iris. And I know they would have loved the wild purple, pink and white lupins that grow like weeds here and especially at our place. Lupins ring our land and the colour is often deep purple. I want to show you how I painted and drew these flowers using fluid acrylics over a base of wet matt medium and I’ve made a tutorial for you about this. Enjoy! 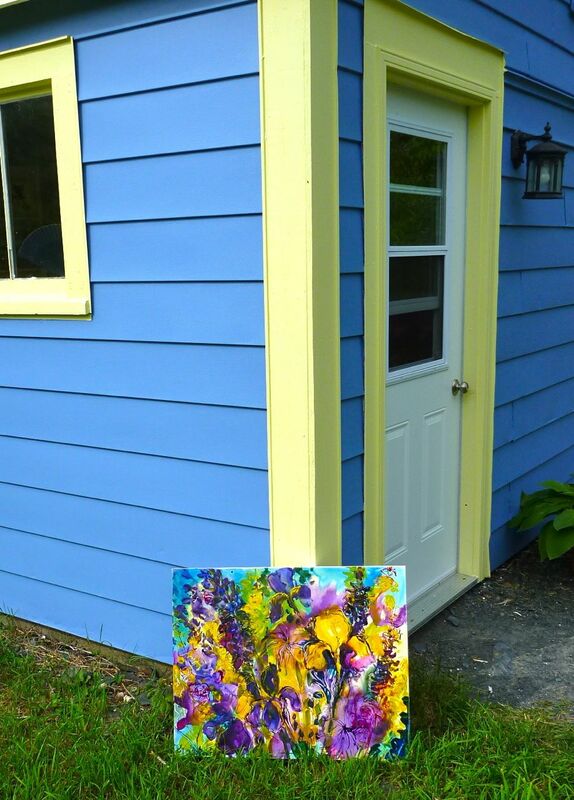 I paint from life and in early June, the lupins and iris are in bloom here in Nova Scotia. 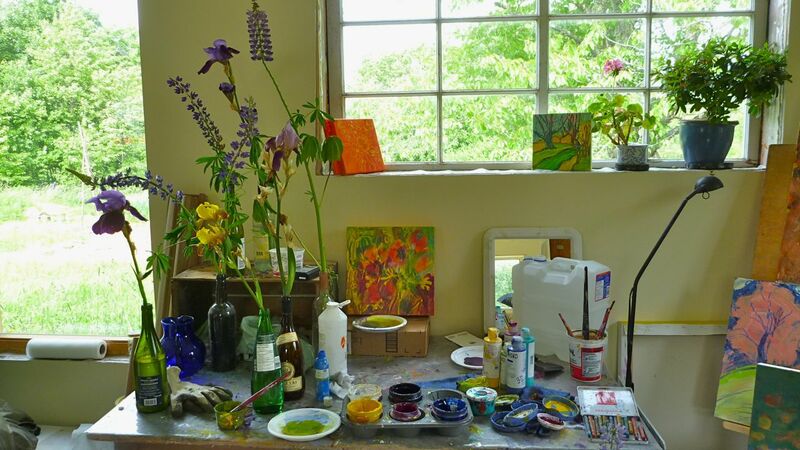 I brought some into the studio and placed them in wine bottles so that I could have good close-up examples of the lupin in the distance. Although I prefer to paint on location, at this time of year the black flies are biting, so I paint inside. There are lupins growing in the distance. 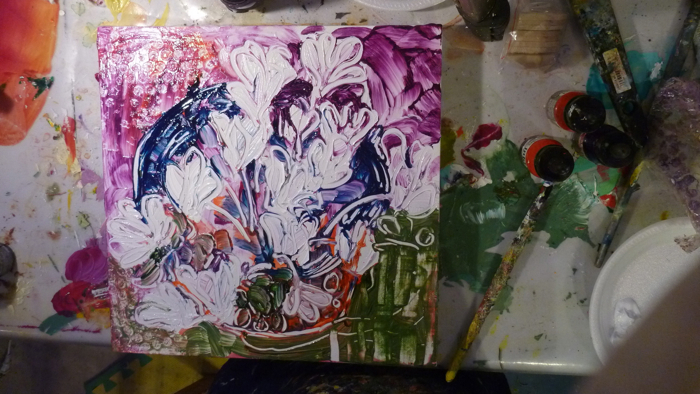 I started this painting applying watered-down acrylic on a primed canvas. I wanted to achieve a soft, wet in wet watercolour effect. When that dried, I applied a thick coating of matt medium over the entire canvas and then painted into it with my fluid acrylic paints. I keep them in sealed plastic containers in a muffin tin. That way they are always ready to use. 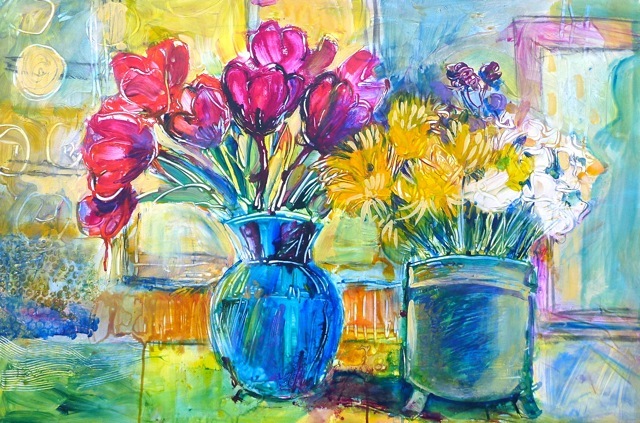 I try to limit my palette to five colours or fewer because it creates a better colour harmony in the painting. I paint with nylon brushes and I also use a rubber-tipped scraper to draw shapes into the painting. I dip the scraper into my paint and draw with it much like dipping a pen into ink. I like the calligraphy effects that I can get by pushing the paint away and creating a line and a texture. If the medium gets too tacky, I moisten it with a spray of water. 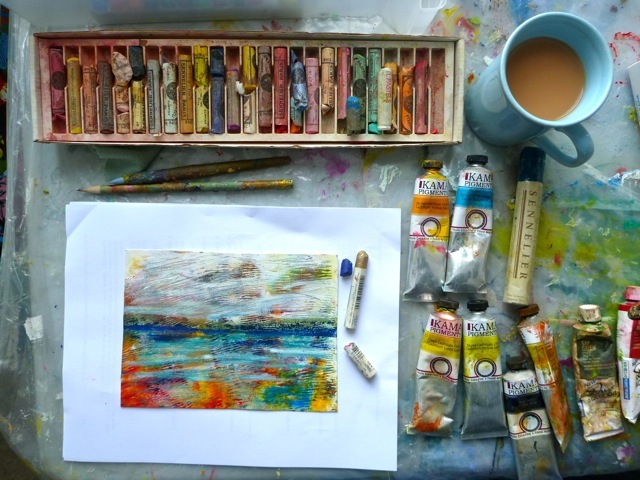 The water also makes the paint run which adds an interesting softening effect to the work. Golden fluid acrylics are transparent and have a high level of pigment. As long as the medium is moist, the painting can be worked on and the scraping will reveal the colours underneath. 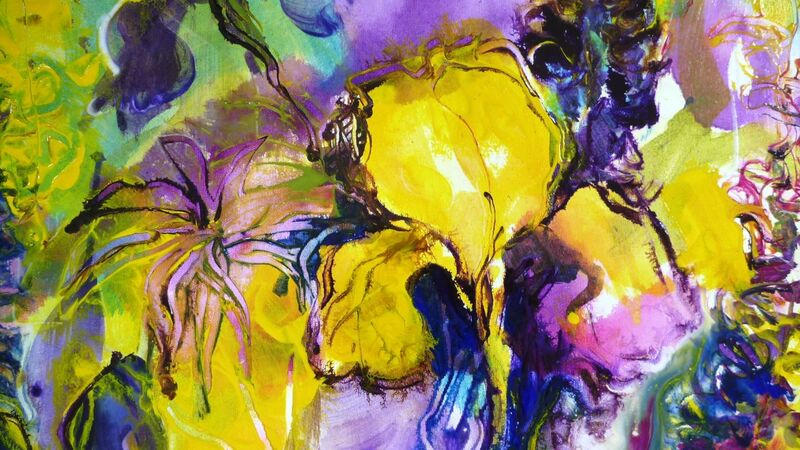 I love iris and I deliberately choose purple and yellow because they are complementary colours and they make the painting vibrate. Although I have an easel, I painted this on the floor because otherwise the entire painting would drip and run if I placed it upright. That’s because I have a coating of wet matt medium on the canvas and that is the tip or secret that I am sharing with you. I came across this quite by accident and now I almost always paint with acrylic this way. For one, it delays the drying period, which I like; but the biggest advantage is that I can create all kinds of textures and linear marks in the painting by pushing away the colour with a scraping tool and revealing the layer of colour or canvas underneath. I bought a gorgeous yellow iris at a plant sale this spring and I wanted to make it the focal point in this painting. 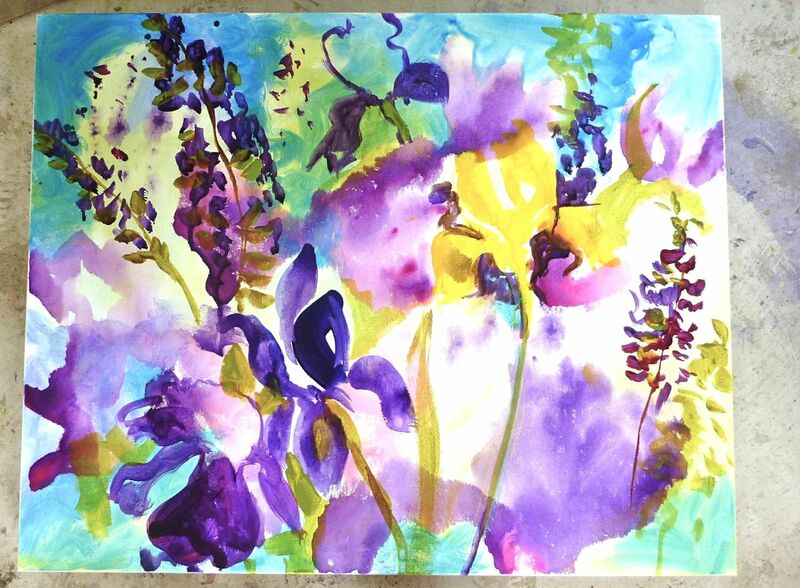 Unfortunately, by the time I painted this, it had finished blooming, but I used my huge purple bearded iris as reference. That’s the beauty of being the painter. 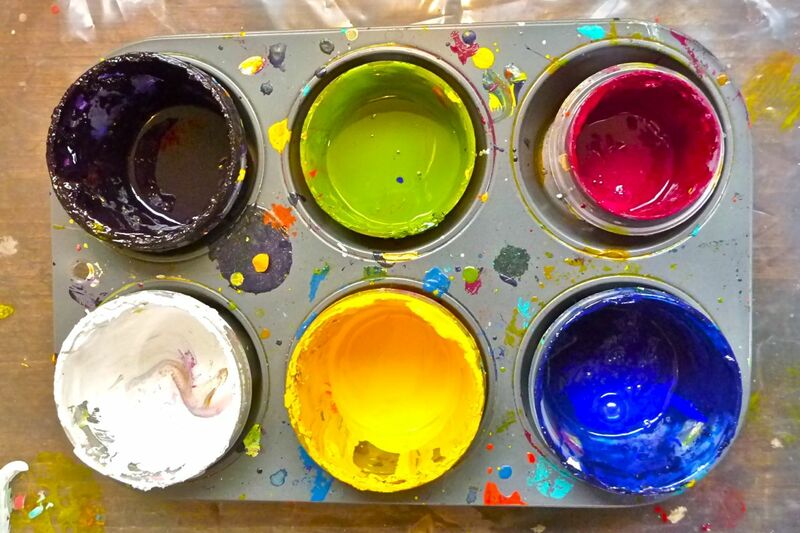 You can change the colours of anything in your painting to suit your mood! Painting detail. The purple bearded Ontario iris transforms into a yellow Nova Scotian flower. 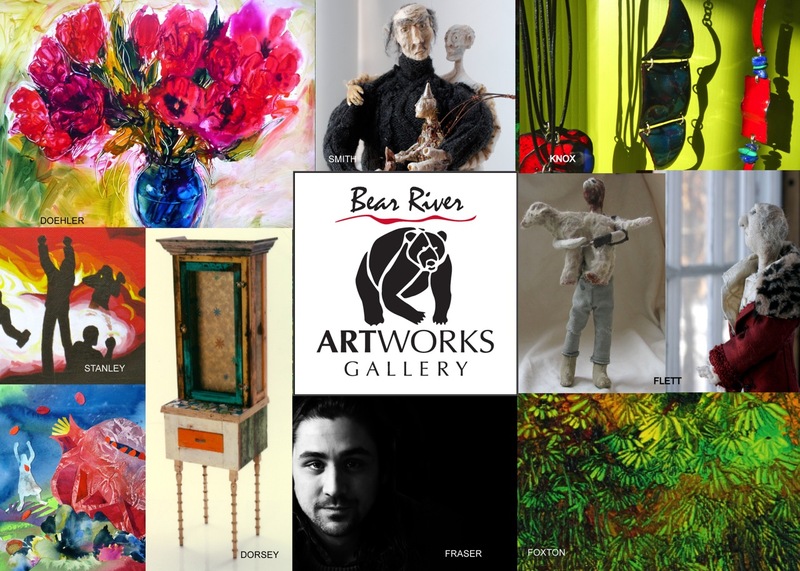 I am thrilled to say that Larry and I and 6 others have formed The Bear River Artworks Gallery The opening is this Friday April 17 at 6 pm and we would love for you to join us. If you can’t come on Friday night, then please join me on Saturday 10 am – 4 pm to view the works. I’ll be sitting the Gallery that day. For sure I’ll post some pictures on my website after the event. @ The Oakdene Centre, 1913 Clementsvale Road, Bear River, Nova Scotia. The gallery will remain open on Sat (18th) and Sun (19th) from 10-5. 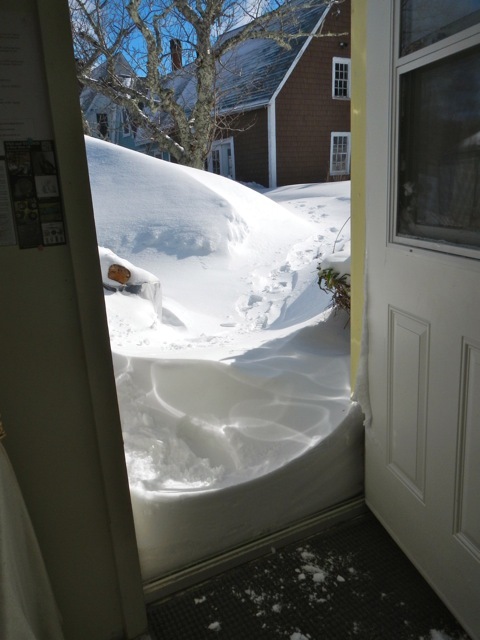 And it’s a good thing we had a new gallery to organize because winter in the Maritimes this year was brutal. 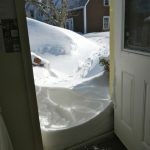 The snowfall broke all records. The trick was to not despair. The upside of it was that I spent more time in the studio painting than I have any previous winter. What’s New on the Easel? Since January I’ve been making regular trips to the grocery store in Digby to buy tulips. They have cheered me tremendously. It’s a good thing too because I need new paintings for a new gallery. Working with oil pastels and oil paint. I am interested in the line between abstraction and reality-based painting. 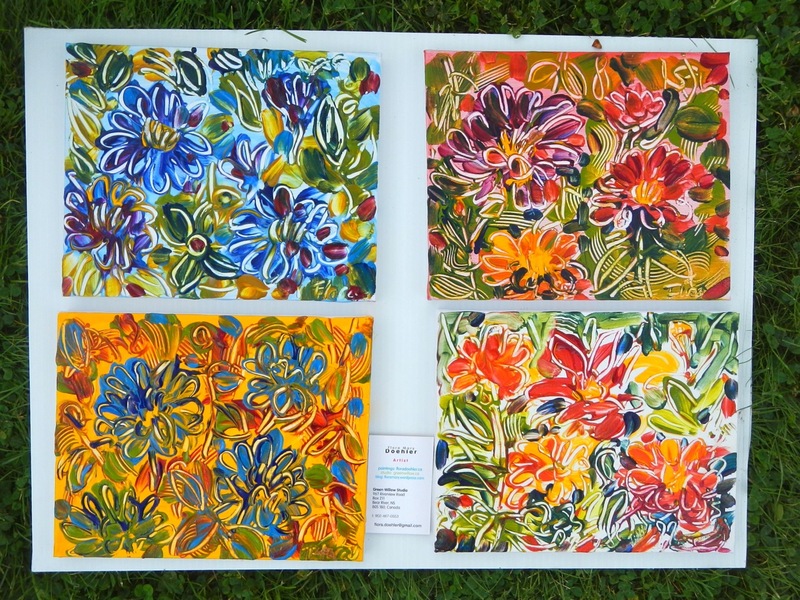 Read here about my unexpected path from the garden to these paintings. My other big news is that my work is included in a new book about how to paint with acrylics. The book is published in the US and the UK and I am happy to be invited to participate. Here is my back story about this. If you haven’t already, please follow my art page on facebook. where I post regular images from the studio. Read my website for articles, video tutorials and paintings. And please share this with a friend who may sign up for my studio news. Sometimes luck and opportunity come knocking together. 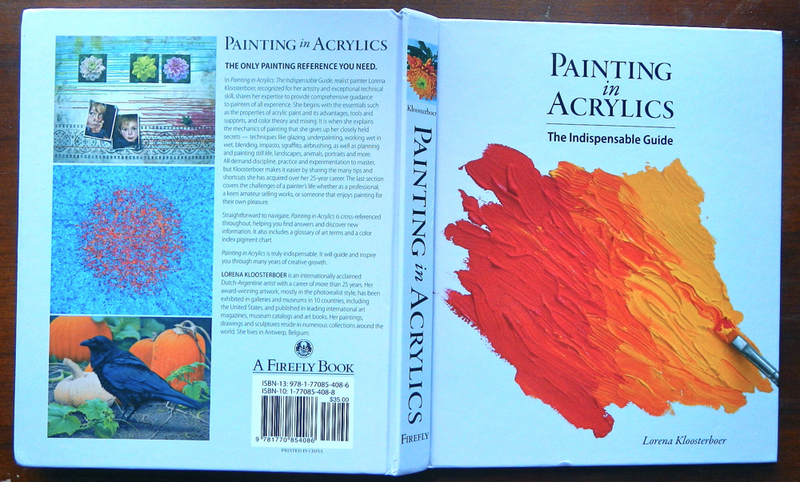 Over a year ago I was invited to participate in a new comprehensive book–Painting in Acrylics – the Indispensable Guide. The publisher emailed to ask if they could feature a couple of images of paintings from my website to illustrate the chapter on sgraffito painting. 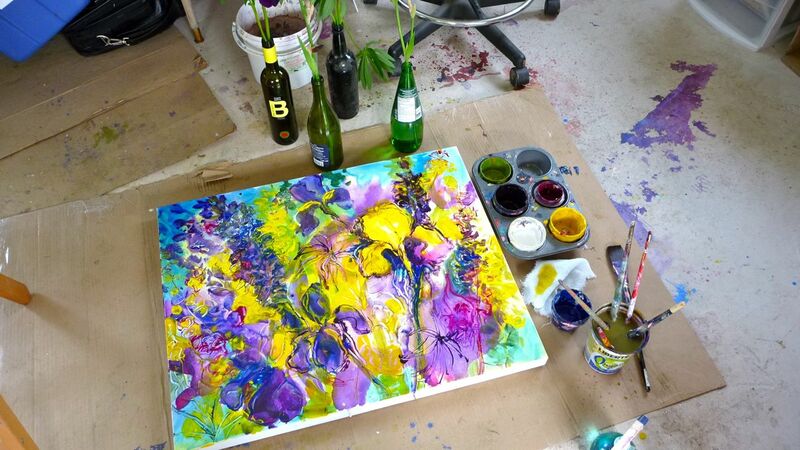 The artist-author Lorena Kloosterboer lived in Belgium and the editor in England. The book would be published in the UK and the US. In return for my images I would be given credit in the book, my website would be mentioned and I would receive a copy of the finished book. I have to admit that my 1st reaction was skepticism. Like many visual artists I’ve been invited to publish my work in the past–but at a cost of hundreds of dollars in ‘books’ that would only be distributed to the participating artists. But this offer was and is bona fide. The publisher is Quarto in the UK and Firefly Books in the US. So how did this opportunity come about? The author found my website in an internet search. I had tagged some of the paintings as sgraffito . She was looking for samples of that style. So if you are an artist, let this blog post be a reminder to you to include detailed descriptions of your artwork and your methods on your website so that search engines–and publishers–can find you. Even the studio was shown, along with a shot of my set up at Paint-the-town. It has taken years for this book to go from concept to publication. 12 months ago I submitted many images of my paintings, my studio, and my painting setup to Quarto. I sent high resolution jpegs to the publisher through the free version of Dropbox. It is a server ‘in the cloud’. I uploaded the large images required for printing, shared the password, and Quarto downloaded them. I didn’t have to make a DVD or snail mail anything. 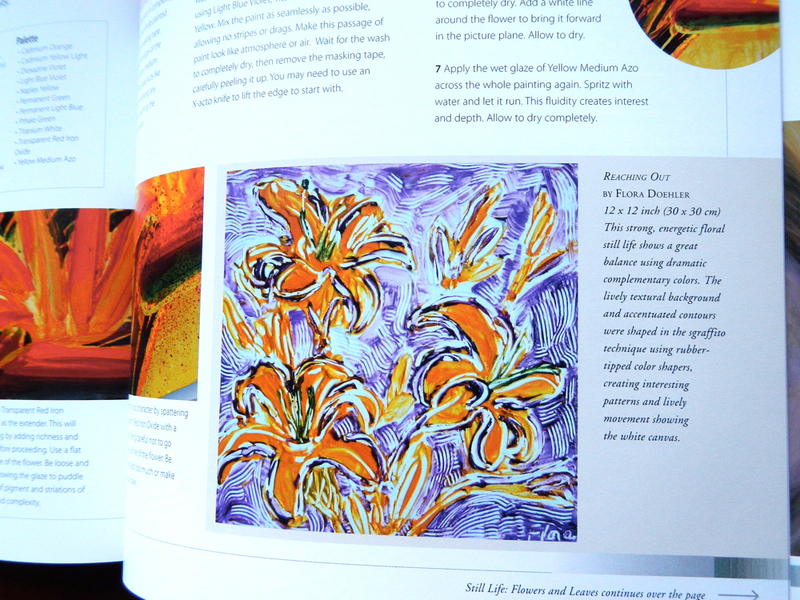 Just before Christmas I received my very own copy of Painting in Acrylics – the Indispensable Guide. 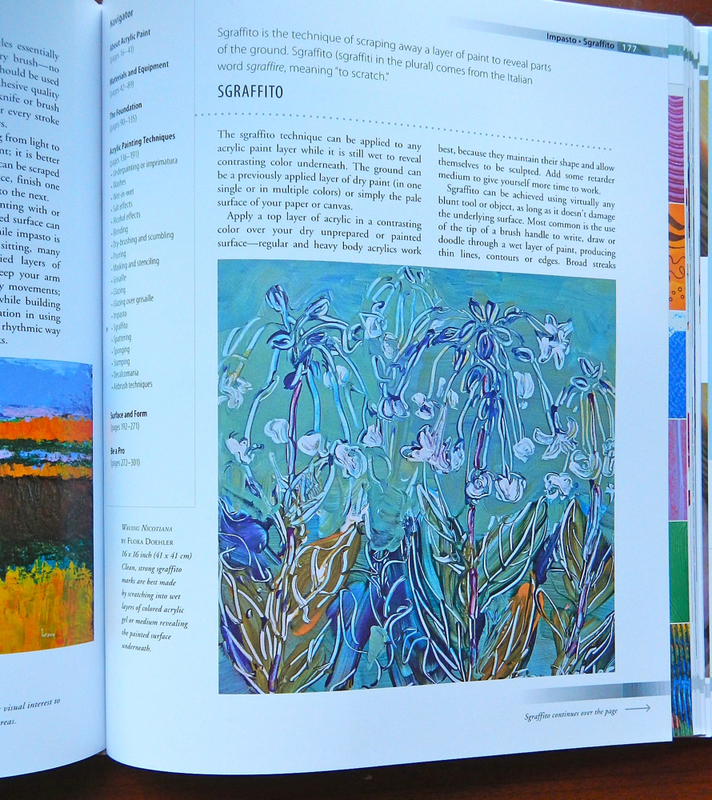 I am so thrilled that my paintings are part of this international book. There are many painters included whose work I admire. This is the most comprehensive acrylic guide I have ever seen with extensive information about acrylic painting–styles, materials, color theory and so much more. There are paintings from over 90 artists all over the world. Artist – author Lorena Kloosterboer writes clearly and is generous with her step-by-step descriptions of her own high realism painting process. I love experimenting with art materials and this book will show me new ways of working with this versatile medium. I highly recommend this book for artists at all levels. I know that for me, getting my hands on it is a great way to start 2015! If you want to take a closer look at the book, click on this link to view it and my current favorite art-related books. 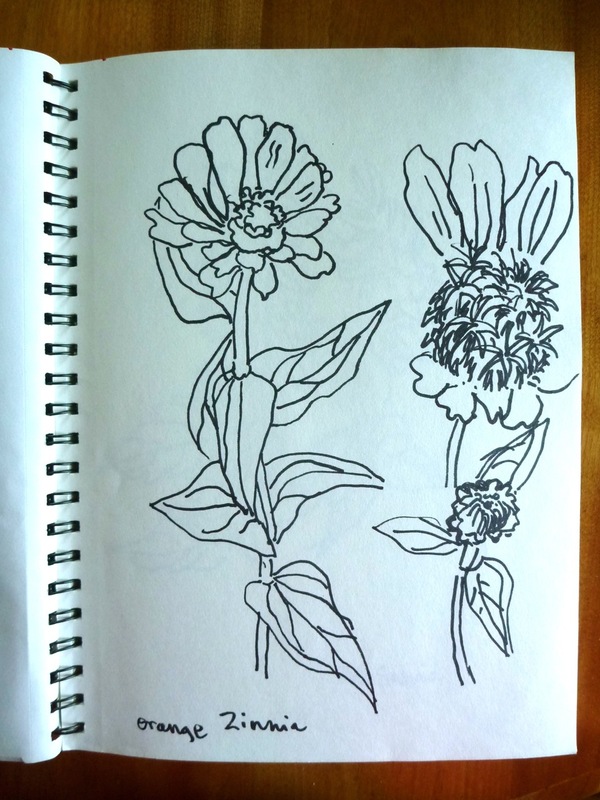 I love the Victorian Garden in the Annapolis Royal Historic Gardens with the sunny, happy flowers such as the zinnias. This Shangri-La of a garden doesn’t know that the rest of us have experienced killing frost in our beds. I can never resist setting up my paints near the salvia and zinnias during Paint the Town in August. At first glance, zinnias look so uncomplicated, but the photos I took yesterday show a tiny garden of lily-looking florets sprouting out of the middle of the flower. Each bloom is a universe of colour. 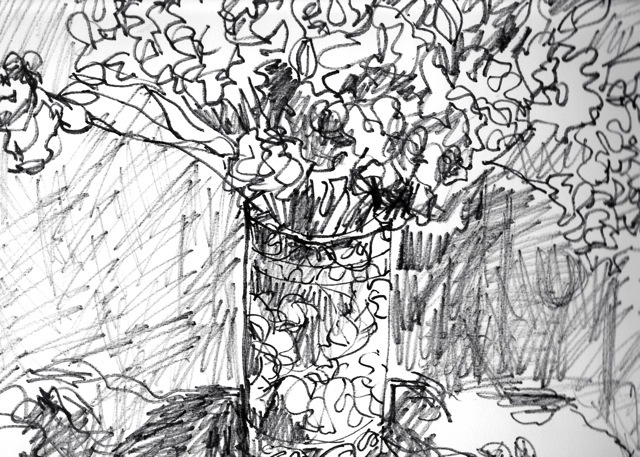 I was travelling light yesterday and brought just a sketchbook and a fat marker. I had no chair or support for my sketchbook and stood while drawing. It was a bit awkward, but gave me a good vantage point for eye-level flowers. Later, at home, I added watercolour to my drawings. 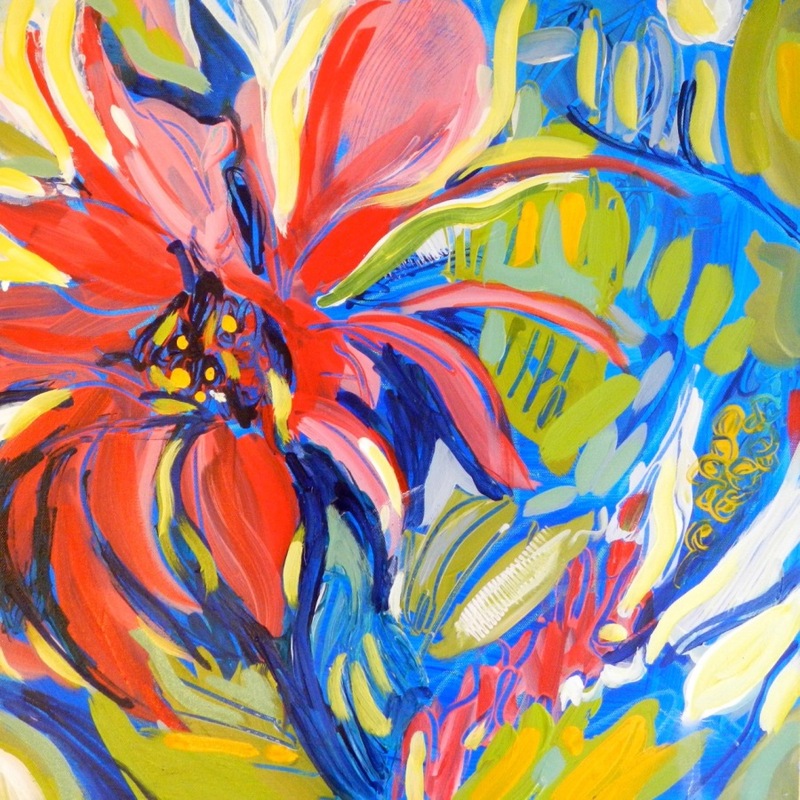 When I paint or draw a flower, the process helps me to get to know its uniqueness. I learn more about the shape, the veins in the leaves, the petal details, the way the flower leans. 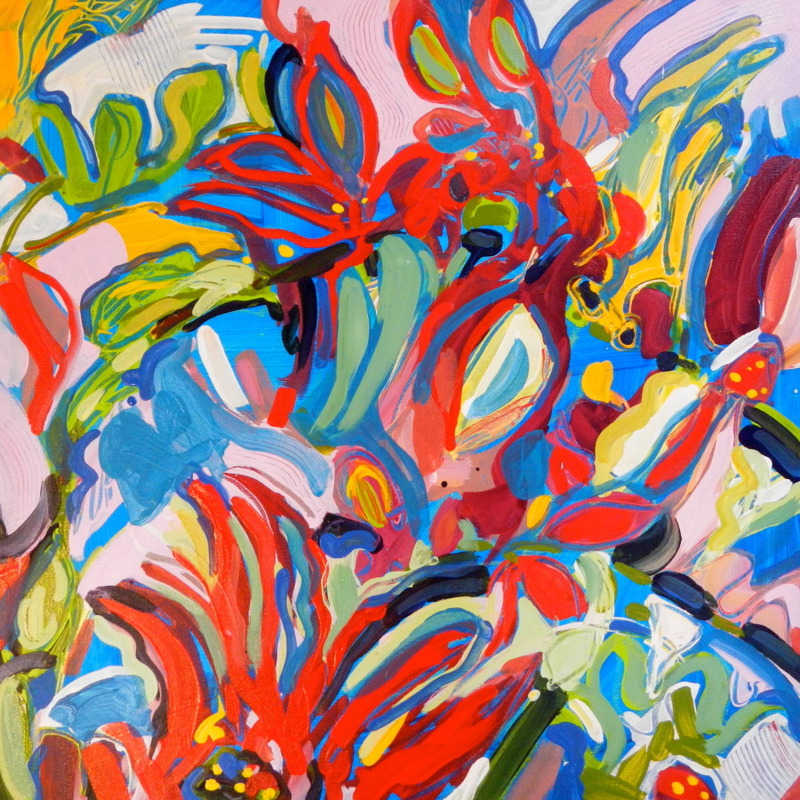 I enjoy trying to capture the movement and the joy of these outrageously colourful and happy flowers. 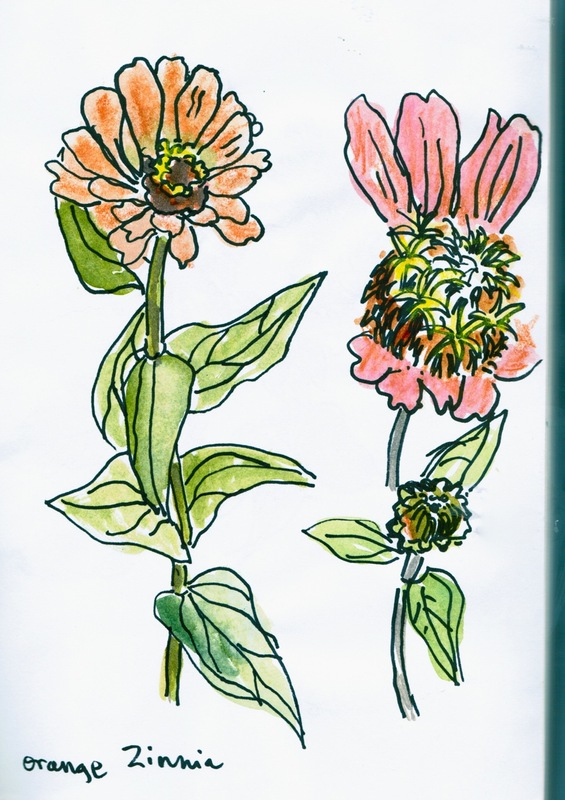 I painted these Zinnias a month ago during Paint the Town. Imagine, they are still blooming! Tomorrow I’ll show you what I found in the perennial bed. Could This be my Favorite Painting? I like the contrast, the composition, the texture and the colours. 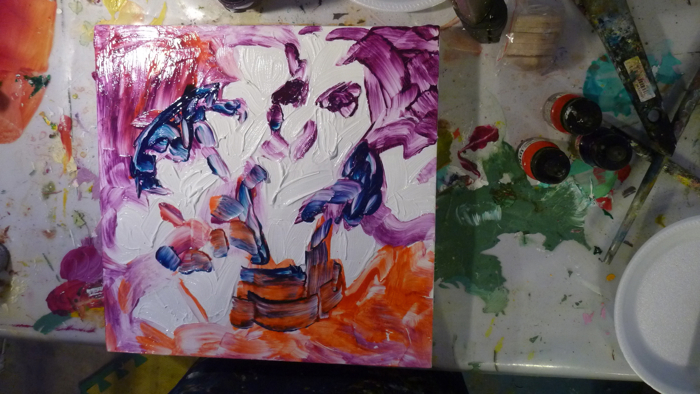 But more importantly, the real fun is in making the painting because there is a mystery in the process. I make the decisions about colour and method and technique, but as soon as I pick up the brush, the painting takes on a life of its own and evolves and shows me where to go next. Every painting is like solving a puzzle and it is embarking on an adventure. 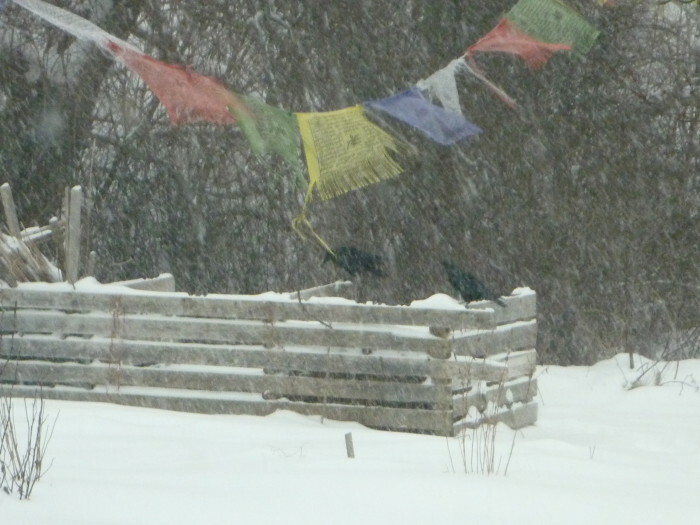 It helped this week that snow swirled out the studio window while crows dug into the compost for any scraps they could find , (including eggshells). It made the studio time even sweeter with soothing music and coffee and a crackling wood stove. I started by flooding the canvas with gel medium. It’s like spreading a clear custard. 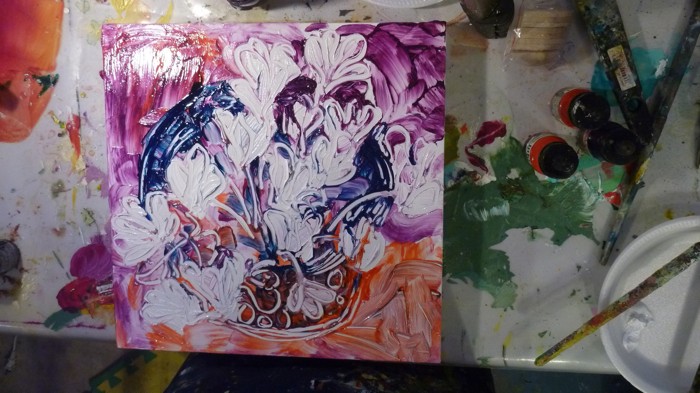 While the medium is still wet, I brushed in the shapes of the cyclamen flowers with white acrylic paint. Then I got out my Liquitex inks that are intensely pigmented and transparent. I squirted out the ink into strategic areas of the wet canvas and gently brushed it into the gel. 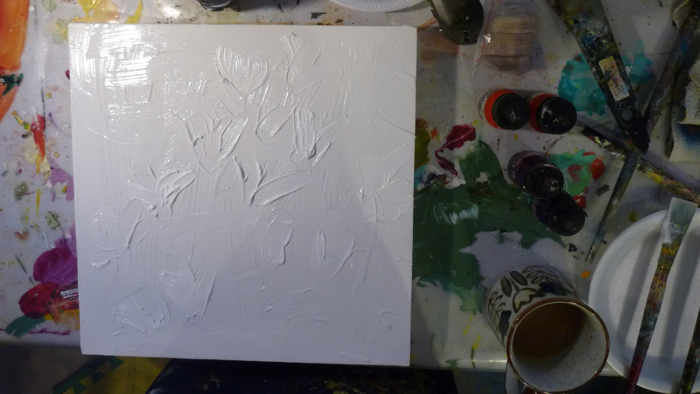 Next, I drew the flowers and various other marks and lines on the canvas with my rubber tipped colour-shaper. You can see that the gel is still wet which is a great advantage to me because it will display the brush strokes and textures. I added some texture by ‘lifting’ some of the ink with bubble wrap and a scraper. I continued adding detail. I let the painting dry. The following day I added some gentle blue tones to the flowers to give them more dimension. Hi there! I’m thrilled to tell you that I’m having a showing of my paintings in Bear River at the end of January. This will be an opportunity for me to show large paintings from the last couple of years in one space. I will work on a painting onsite during the show. downstairs location (1890 Clementsvale Rd.) in Bear River. 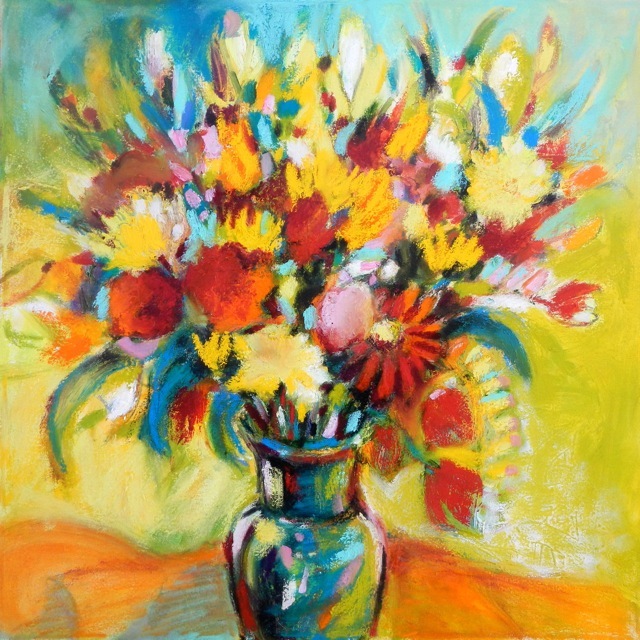 Gallery opening with refreshments on Sat Jan 26, 1 – 4 pm. I’ll be painting starting on Thur. Jan. 31. All welcome. 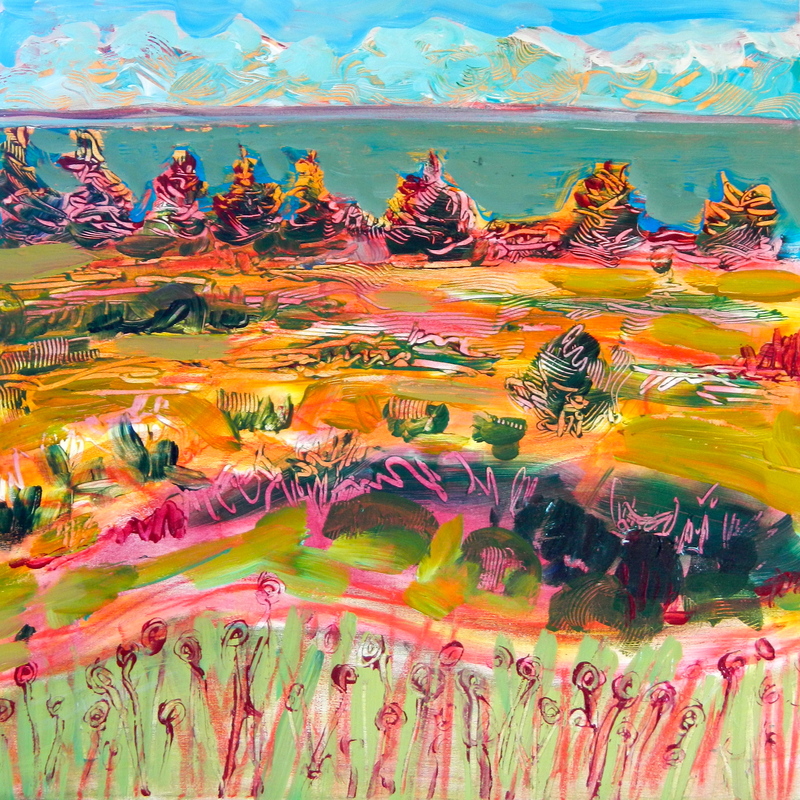 Summer on Brier Island, by Flora Doehler, c. 2012. Here is one of a series of short videos to show you some of the paintings that will be on display. This summer we’ve had very hot weather which made painting difficult. Acrylic paintings I worked on dried faster than I wanted them to. So, I’ve been using gel mediums that are formulated to slow down the drying time of acrylic paint. 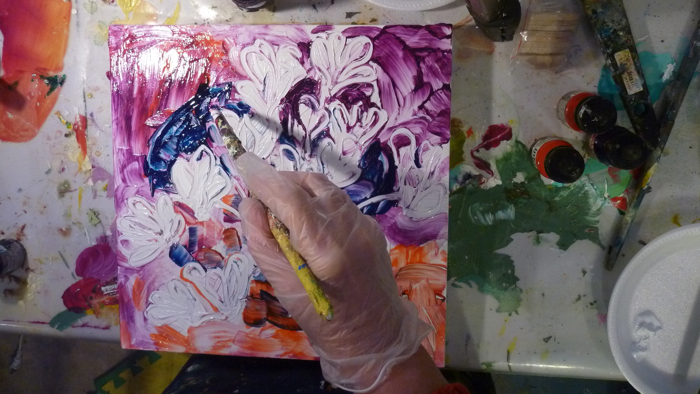 This allows me a longer time to apply the paint and to draw into my work revealing the canvas underneath. Let me show you the steps I take. 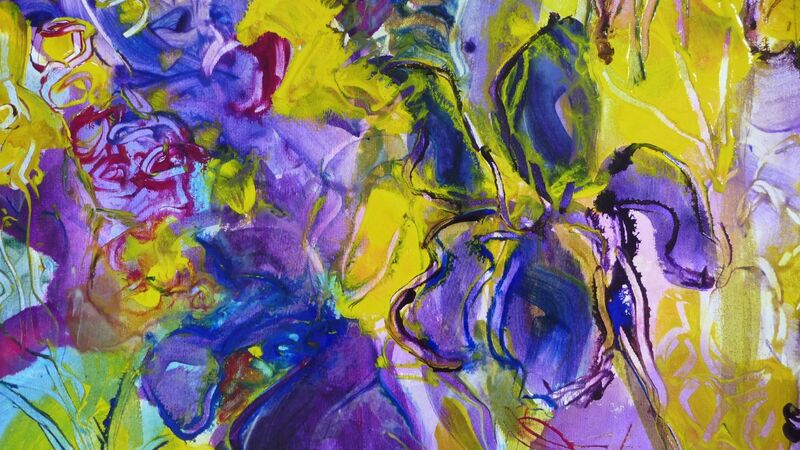 Brilliant yellow golden globe flowers were one of the inspirations for this painting. First I paint the medium on the entire canvas. I used a combination of a pouring medium from Golden Acrylics and a thicker one from Liquitex. For the background colour I dripped Liquitex inks into the medium. Canvas with wet gel and ink. Then I blended the ink into the gel with a brush. This will be the background and will help to unify the painting. Next, I studied my reference materials…in this case flowers from my garden that have bravely weathered this summer’s drought! 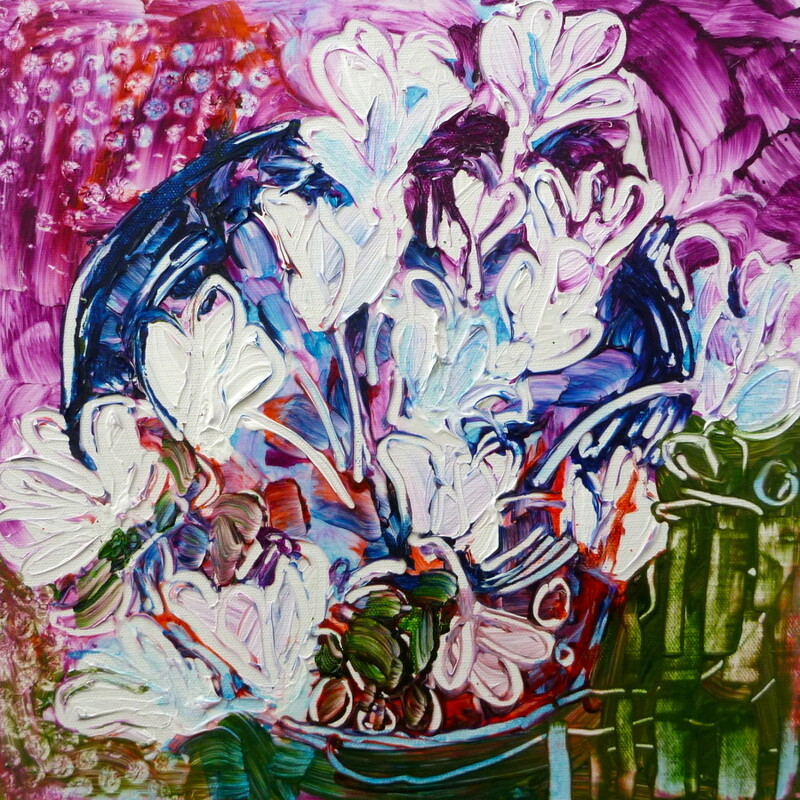 Then, using broad strokes, I painted a suggestion of flowers onto the canvas. I try to lay in the colour with single strokes. This way, the gel allows every brushstroke to show. I like the freshness of painting this way. Sometimes I put two colours on the brush to add to the surprise and spontaneity of the brush stroke. I mostly paint with Golden Fluid Acrylics and I keep them in small plastic containers. I use lots of brushes and rubber-tipped shapers. Finally, I draw the scene using a rubber tipped shaper. This technique is called sgraffito. I add a few more colours and at this point it is a push and pull effort. I try to keep the freshness of the colours as well as building up a contrast and creating a pattern of colour that goes through the entire painting. I can only get this effect by using gels and the slower drying mediums/gels allow me to work for several hours on the painting. I am happy with my result. It totally reflects the joy I felt in looking at my garden flowers on a hot day in August.